Twice a year, we press pause on our day-to-day operations here at LeagueApps and come together as a company. We use this time to recharge, focusing on our mission and our company values. We discuss our goals and our vision for growth. We call our company off-site “OTAs,” Organized Team Activities. This year at OTA XV, we were lucky enough to bring together a panel comprised of a number of our partners. Our speakers included Corey and Mike Winkoff from FLG Lacrosse, Mitch Storch from Hoop Heaven, Vinnie Bonaddio from MSI, Kurt Oriol from Real Madrid Soccer Camps and Rodrigo Gomes from Northern Virginia Volleyball Association. The panel offered many sights into youth sports. Despite specialization in different sports and products, the panelists shared key business tactics common to all: exercising constant communication, creating beneficial partnerships and providing player feedback. Across the panel, there was a consensus that communication is just as important off the sports field as on. Among parents, players, coaches, and tournament directors, lines of communication need to be open and flowing with information. It is virtually effortless to communicate with one another nowadays and it is necessary for youth sports businesses. Communication reaches farther than updates, it is a sign of a well-run business. Whether it’s a change in the tournament schedule or an update that Coach X is running late because he got into a fender-bender, parents want to be informed. And a lack of communication is an excuse for parents to become your biggest pain. With technology being as expansive as it is, information doesn’t need to come in the form of an email. Creating a parent or player group chat is a simple way to erase headaches and communicate the important changes right to everyone’s cell. Big or small, from camp itinerary to gym time schedule to club sports, youth sports businesses require constant communication. Similar to other business genres, finding the right teammate and partner is vital for youth sports businesses. The panel produced four key criteria necessary for entering a partnership: mutual benefits, synergy, real-life returns and brand alignment. Mitch Storch found that pickleball was a great opportunity to fill empty gym time and this union created a mutually beneficial partnership in an unexpected place. Vinnie Bonaddio emphasized that partnership synergy requires self-evaluation and understanding each parties strengths. If both sides are fulfilling their end, synergy is achieved because your strengths work together and create a product that is better than what could have been created when separately. Youth sports can be expensive. Rodrigo Gomes found that a partnership with big sportswear brands wasn’t going to give him the ‘real-life’ returns he needed to market his volleyball association while keeping the prices low for his families. As a result, Gomes decided to cut out the middleman altogether and negotiate a unique deal with a Chinese sportswear brand. The final characteristic necessary for a productive and beneficial relationship is brand alignment and connection. The New York Real Madrid Foundation Soccer Camps needed to find a local connection with Spain and David Villa was a perfect partner for them. 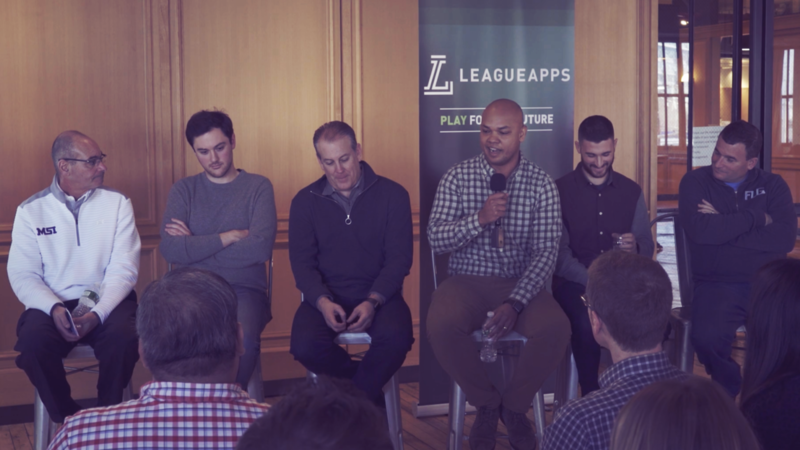 Growing teammates in the sports industry is about gaining assets and finding opportunities, based on the feedback from our partner panel, checking off these four criteria are key before selecting teammates. All of our OTA XV panelists are part of the youth sports ecosystem. Some host leagues, others organize camps, and then there are the club sports organizations. No matter their level of competition, the group all agreed that providing player feedback is key to running a sports business. Behind us are the days of going to practice and coming home and not knowing if your skills are actually improving, or at least these days should be behind us. Whether coaches use film, collect stats or fill out weekly forms about their players, coaches should become more active in their roles and give parents and athletes accessible feedback on player skills. There are various ways to communicate feedback making it nearly effortless for coaches to evaluate players. Receiving feedback from coaches should become a standard feature of participating in youth sports. Whether you already run a youth sports business or you are thinking of starting one, exercising constant communication, creating beneficial partnerships and providing player feedback are going to be key for your business’s success. But don’t take our word for it. Listen to Corey and Mike Winkoff, Mitch Storch, Vinnie Bonaddio, Kurt Oriol and Rodrigo Gomes. Whether you already run a youth sports business or you are thinking of starting one, exercising constant communication, creating beneficial partnerships and providing player feedback are going to be key for your business’s success. But don’t take our word for it. Listen to youth sports entrepreneurs like Corey and Mike Winkoff, Mitch Storch, Vinnie Bonaddio, Kurt Oriol and Rodrigo Gomes.